The following sections describe how to confiugure the Bank Assistant and the associated VT 'Company' file. In order to use the Bank Assistant, certain information must exist within both the VT application and the Bank Assistant configuration. Both the 'Trader' and 'Agency' Licences allow the creation of multiple Bank Assistant workbooks, each linked to a specific Bank Account within a VT file. The 'Trader' Licence is limited to a single VT file, whereas the 'Agency' Licence allows access to multiple VT files. The 'Trader' software licence is validated using your Licence Number, which is allocated to you at the time of purchase. This is normally your VAT Registration Number (for VAT registered companies) or the Bank Account Number of the VT default Bank Account (for Non-VAT registered companies). For VAT Registered companies only, populate your VAT Registration Number (via the Company properties). For both VAT Registered and Non-VAT registered companies, populate your Bank Account Number within your default Bank Account (via the Bank Account properties). This is used to validate the download file during the Bank Statement import. If you wish to use another copy of the Bank Assistant with a different VT Bank Account then also populate the relevant Bank Account Number for that Bank Account. The 'Agency' software licence is validated using your Licence Number, which is allocated to you at the time of purchase. This is normally your VAT Registration Number (for VAT registered companies) or a unique 9-digit number (for Non-VAT registered companies). For both VAT Registered and Non-VAT registered companies, for each VT file in use, populate your Bank Account Number within your default Bank Account (via the Bank Account properties). This is used to validate the download file during the Bank Statement import. 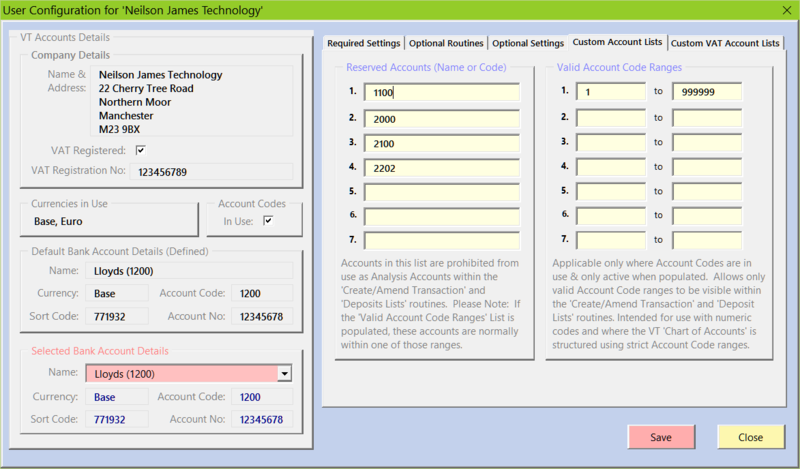 Within the User Configuration, check the Selected VT Bank Account. This is initially set to your default Bank Account. Note: You can create multiple Bank Assistant workbooks linked to different VT Bank Accounts. Within the User Configuration, check the Accounting Period dates. 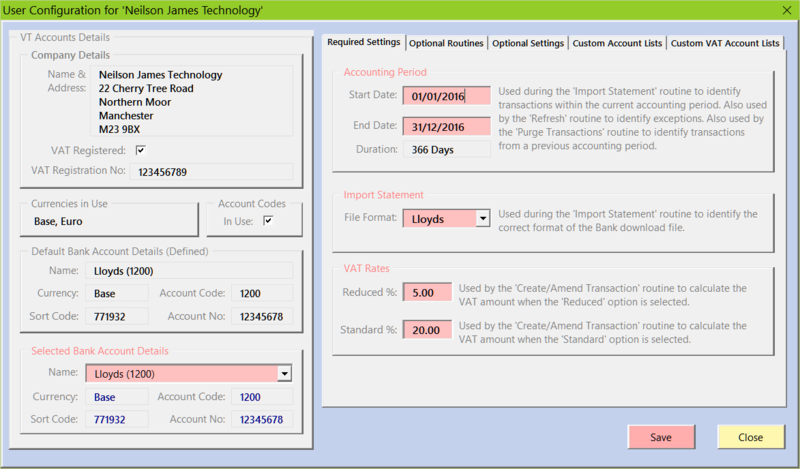 On first use, these are populated with the current VT accounting period where available. This period can be changed independently of VT to facilitate transitional periods at year end. The 'Refresh' routine ignores reconciled transactions dated before the Period Start Date. Within the User Configuration, populate the Import Statement File Format by selecting an item from the dropdown list. This is required to identify the correct download file format during the Bank Statement import. A configuration integrity check is undertaken automatically at the start of each of the main routines. Where failures are encountered the results are displayed in a form. Integrity check failures may prevent the execution of these routines. The integrity check form is always displayed at the start of the 'User Configuration' & 'Licence' routines and after the completion of the 'Restore Data Tables' routine. Certain failures will require resolution in VT, whereas other failures can be recified using the Bank Assistant 'User Configuration'. The User Configuration enables customisation of the Bank Assistant to suit specific business requirements. Certain settings are required, whereas other settings are optional. A configuration integrity check is undertaken and the results displayed in a form. This highlights potential problems before the configuration form is displayed. Selected Bank Account: This is the VT bank account to be used with the Bank Assistant. On first use of the Bank Assistant, this is set to your default Bank Account. (This default account is also known as the Defined Bank Account). Note: You can create multiple Bank Assistant workbooks linked to different VT Bank Accounts. Note: This setting is used to validate the download file during the Bank Statement import. Account Period Start and End Dates: On first use of the Bank Assistant, this is set to your default Bank Account. (This default account is also known as the Defined Bank Account). Import Statement File Format: Select the format from the dropdown list. This item is used during the 'Import Statement' routine to identify the correct format of the Bank download file. Reduced and Standard VAT rates: The VAT rates are applicable only for VAT registered companies. On first use of the Bank Assistant, these rates are populated with the default values, 5% and 20% respectively. Note: These rates are used by the 'Create/Amend Transaction' & 'Deposit Lists' routines to calculate the actual VAT amount when the 'Reduced' or 'Standard' VAT option is selected. Allow Update: This option allows or denies the updating of transactions to VT. Allow Delete: This option is applicable only where 'Allow Update' is Yes and allows or denies the deletion of VT transactions. Allow Text Amend: This option is applicable only where 'Allow Update' is Yes and allows or denies the customisation of VT transaction Text. Note: The 'Create/Amend Transaction' routine normally generates a preformatted text. 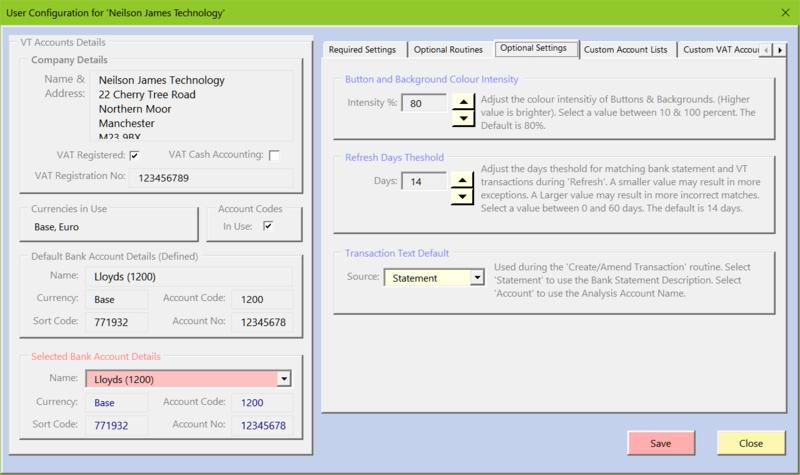 Allow Deposits: This option is applicable only where Account Codes are in Use and allows or denies the updating of Bank Deposit Lists from the Bank Assistant to VT.
Colour Intensity: This option adjusts the colour intensitiy of Buttons & Backgrounds (Higher value is brighter). Select a value between 10 and 100 percent. The Default is 80%. Refresh Days Threshold: This option Adjusts the days theshold for matching bank statement and VT transactions during 'Refresh'. A smaller value may result in more exceptions. A Larger value may result in more incorrect matches. Select a value between 0 and 30 days. The default is 14 days. Note: Cheque payment transactions (type 'CHQ') ignore this rule. 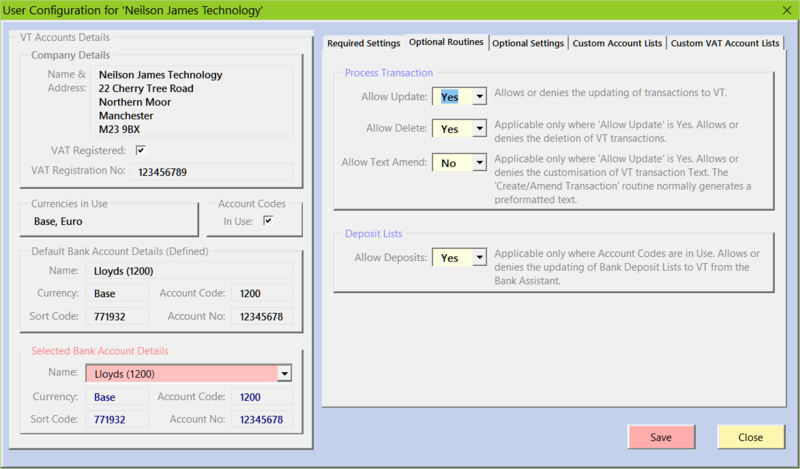 Transaction Text Default: This option is used during the 'Create/Amend Transaction' routine. Select 'Statement' to use the Bank Statement Description. Select 'Account' to use the Analysis Account Name. Reserved Accounts: Accounts in this optional list are prohibited from use as analysis accounts within the 'Create/Amend Transaction' and 'Deposits Lists' routines. Valid Account Code Ranges: This optional range is applicable only where account codes are in use and only becomes active when populated. Allows only valid Account Code ranges to be visible within the 'Create/Amend Transaction' and valid within the 'Deposit Lists' routines. Intended for use with numeric codes and where the VT 'Chart of Accounts' is structured using strict Account Code ranges. Zero Rated Account Codes: The VAT rates are applicable only for VAT registered companies. This optional list is used during the processing of 'Deposit Lists' where entries are analysed to 'Profit and Loss' accounts and the VAT column is left blank. Entries analysed to accounts that are included in this list will be rated as Zero VAT. All other 'Profit & Loss' analysis accounts will be rated as Standard VAT unless the account is normally outside the scope of VAT. Please Note: This list only becomes active when it contains at least 1 account. If this list is empty all 'Profit & Loss' entries are validated to ensure a valid VAT Rate or Amount exists. Intended for use when processing sales receipts to the 'Income' Ledger and where the 'Income' Ledger is structured using specific VAT Rated accounts. 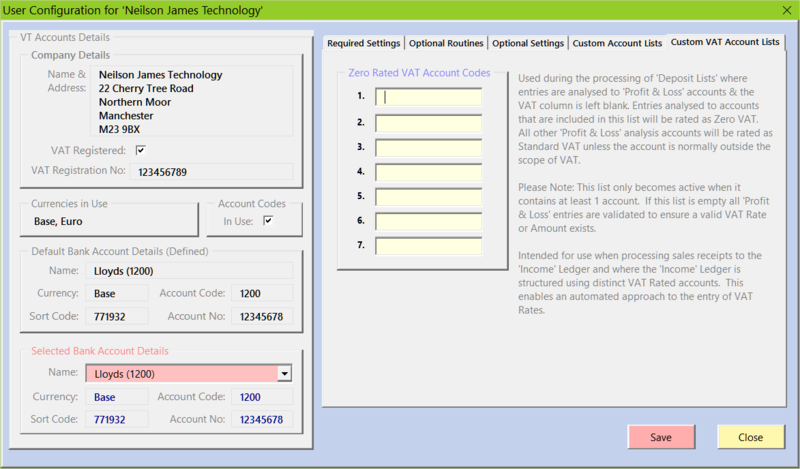 This enables an automated approach to the entry of VAT Rates.